"If someone calls 911, you're looking at an indeterminate amount of time before an officer can respond," says Barry Donelan, 40, a sergeant who is president of the Oakland police union. "Citizens are suffering." Reversing a renewed rise in violent crime is out of the question, he says. This year, the number of murders in Oakland has risen 16 percent; rapes, 24 percent; and burglaries, 43 percent, according to a city crime report. The average response time to emergency calls in Oakland has slowed to 17 minutes this year, the San Francisco Chronicle reported in August. 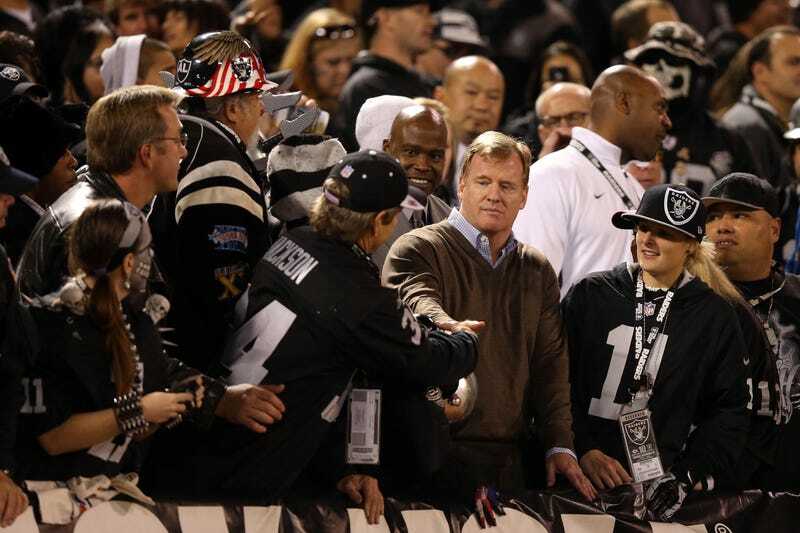 The Raiders, 2012: Making Oakland citizens suffer in creative new ways. In addition, the piece notes, "Jacksonville, Florida, also fired police officers and cut services while lowering the Jaguars' rent 11 times since 1993 and deferring $12.3 million in rent payments." There's much more, including the way organizations can leverage the threat of leaving, and the complicated process by which the city of Oakland ended up paying Goldman Sachs $4 million annually through the Raiders, so go read it. The Raiders are losing to the Panthers anyway.